My Time: Happy St. Nick's! It is tradition in Chad's family to celebrate St. Nick's. Every year on December 5th we read the following story, put our shoes out, leave celery and water out for the horse and go to bed. When we wake up in the morning we find goodies in our shoes. It is so much fun! When Jack went into the living room first thing this morning he shouted "We have been so good this year!". Jack has started collecting nut crackers and "St. Nicholas" has supported the tradition by bringing the boys a nut cracker each year. The boys also got Transformers and pajamas (thanks Roxy!). 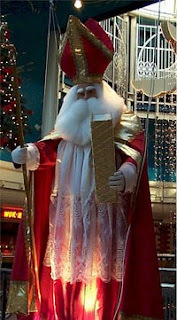 In the Netherlands, December 5th is Saint Nicholas Eve, or Santa Klaus Eve. For over 600 years, Saint Nicholas and his Moorish servant, Swarte Peit, have been bringing Dutch children their holiday gifts. In Dutch tradition, Saint Nicholas, the fourth century Bishop of Myra, was born in Spain. The long bearded bishop wears a white robe, crimson cassock and tall red miter (official headdress) and in his white gloved hand he carries a gold colored crosier, shaped like a shepherd’s crook. Each year he and Swarte Peit journey to Amsterdam from Spain. Usually the saint makes his trip aboard the steamer “Spain.” His retinues follow in the “Madrid.” The boats arrive amid a clatter of ringing bells, gun salutes and the shouts of thousands of boys and girls. When Saint Nicholas lands, he mounts a white horse and rides through the streets in a grand parade with city officials in attendance. The saint always has a whole brigade of Swarte Peits accompany him on foot, on bicycles or on scooters that puff, blow and make explosive noises! The saint and his helpers have a busy day since they always visit and leave presents at the schools and hospitals. In the small villages, he traditionally rides over the housetops on his white horse. He jumps from rood to roof with Swarte Peit at his side. Swarte Peit is traditionally dressed like a medieval page with a plumed hat and black doublet, hose and gloves. Naughty children fear Swarte Peit, for he carries a large black bag. In it are gifts for the good and switches for the bad. If youngsters are really bad, he may stuff them into the bag and take them back to Spain. He will not return them to their parents until the following year, when they are more polite! Early in the evening Saint Nicholas and Swarte Peit appear at every door in the village. Shortly before the visitors arrive, Swarte Peit throws pepernoten, or hard round spice cakes, down the chimney or the door opens a crack and the black-gloved hand appears and strews a handful of pepper nuts across the floor! Children sing songs of Saint Nicholas and enjoy eating sweet cakes and wassail. Later that same night while the youngsters sleep, Saint Nicholas and Swarte Peit make their rooftop visits. Swarte Peit slips down the chimney, for the saint must not soil his fine robes with soot. Swarte Peit puts presents in the wooden shoes which the children have set in a row near the chimney. But first he removes the offerings left by the children for the saint’s white horse. There may be a lump of sugar, a carrot, a wisp of hay or a cup of water—each child giving according to their means. Among the presents are chocolate letters, spicy cakes and colored marzipans. Often times, switches are left behind along with the sweets to remind the children to behave. When his work is finished, Swarte Peit climbs back up the chimney and rejoins Saint Nicholas. Together they whisk through the night from rooftop to rooftop! This is such a neat tradition! It sounds alot like the one Heather's family does. I bet the boys love it, they get goddies all month long! We did that this year too! We call him his Dutch "Sinterklaas" name though. McKinley was very excited and asked her friends what they got from Sinterklaas too. Sawyer actually got out of bed this morning and found his chocolate initial and ate it in bed around 6:00 am. It was all over him and his sheets! I love it! What a great new tradition for us.